Coast to Coast Reforestation Inc is the only company able to offer Alberta grown bareroot transplant seedlings. 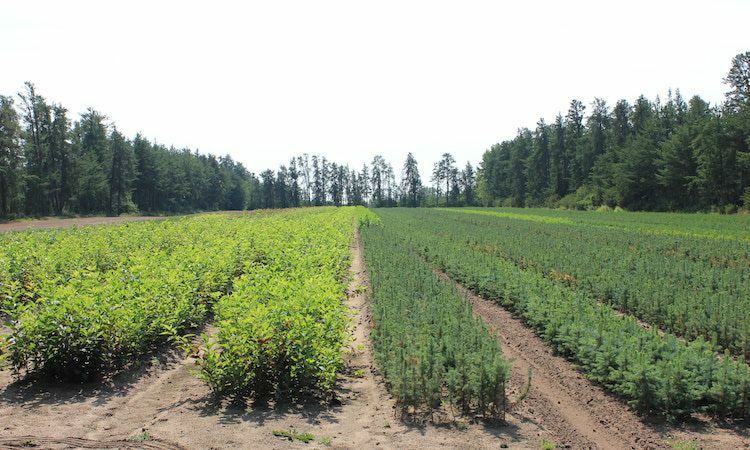 Available in with both coniferous and deciduous stock, bareroot transplants are your best choice for fill plants, private land plantations, or anywhere you need larger trees. P+1 bareroot seedlings are a stock type involving two growing seasons: one in the greenhouse and one in a bareroot field. These trees and shrubs are exceptional in height, Root Collar Diameters (RCDs), bud numbers and hardiness. They often average 50 cm in height with RCDs that average 6.0 mm. Because of the year spent outside, bareroot seedlings are extremely hardy, this stock type is perfect for fill in planting and anyone who is looking for bigger trees and shrubs. Do you have too many trees? Why throw away stock or sell it off at less than cost when you can have twice the tree only a year later with only marginal costs? We can take any trees you have and turn them into bareroot transplants. When extenuating circumstances have you in a bind, transplanting your seedlings can give you an extra year to find a home for them.